It's still brain surgery and those are two words I don't like hearing together. I was talking with Dr. Steven Ojemann, a neurosurgeon at University of Colorado Hospital, about the new ClearPoint MRI platform for Deep Brain Stimulation (DBS) surgery. This technology was developed at The University of California in San Francisco, which is where Dr. Ojemann did his residency. His advisors, Dr. Philip Starr and Dr. Paul Larson, are two of the doctors who have worked on this project and continue to be advisors to MRI Interventions, the company which manufactures this system. Dr. Ojemann has followed this project from the beginning with great interest and in October of 2013, the system was brought to Colorado and installed at UCH. Since then, Dr. Ojemann has performed DBS surgery on 7 patients with Parkinson's disease using the ClearPoint platform. 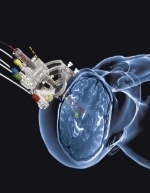 In Deep Brain Stimulation surgery, one or two thin metal electrodes are placed in the brain at a very specific target. They are then attached to a computerized pulse generator, something like a heart pacemaker. This is implanted under the skin in the chest. This pulse generator will be programmed and adjusted by the neurologist so the patient can achieve the best relief from their symptoms. In conventional DBS, a stereotactic frame is attached to the patient's head and then an MRI or CT scan is done with the frame in place so the surgeon can see exactly where the target area is in the brain and plan for the trajectory of the electrodes. Then the patient is taken to the operating room. The surgeon will have to adjust for uncertainties, such as the normal shifting of the brain. To do this, a microelectrode is placed in the brain and used to provide “brain mapping”, recording physiological pattern characteristics to let the surgeon know they are at the target, before the DBS electrode is placed. Sometimes it takes several attempts before the desired target is achieved. The patient has to be awake during this process. They are also required to go without their medication. Having to be awake during brain surgery is a definite turnoff for some patients. The use of microelectrode recording for brain mapping is controversial. Are the benefits worth the risk? Each time the microelectrode passes through the brain, there is a small risk of intercranial bleeding. With the new ClearPoint platform for DBS surgery, the patient can be asleep the entire time and they do not have to stop taking their meds. The procedure is done while in the MRI so the pathway of the electrode can be seen in 3D, real time. Ideally, this can allow the surgeon to make adjustments during the procedure so obstacles, such as blood vessels, can be avoided and the electrode can be placed at the desired target the first time. The advantages seem obvious, but are they? Dr. Ojemann was quick to say that at this time, we cannot claim the ClearPoint system is better, that it has a better outcome than the conventional DBS surgery. However, the data is favorable and he is impressed so far. This new technology does not eliminate all of the risks. It's still brain surgery. There have been challenges. In the beginning, at UCSF, part of the procedure was done in the operating room and part in the MRI suite. After initial concerns about infection in this setting, rates have been very low with modifications allowing the entire procedure to be done in the MRI suite. Another challenge was the magnetic field. Instruments had to be adapted to be MRI compatible. (Okay, I'm trying to write a serious article here, but my imagination is going wild at this point. I'm picturing various surgical instruments flying around the room and sticking to the MRI machine. I'm grateful they've solved this one.) Also, if a patient isn't a candidate for an MRI (ie – someone with a cardiac pacemaker), they obviously are not a candidate for the ClearPoint procedure. All in all, Dr. Ojemann is obviously excited about the possibilities of this new technology. In addition to being useful for people with Parkinson's, there are other applications including treatment for epilepsy, brain cancer – especially deep seated tumors, and surgery for children – who would not be able to tolerate being awake during the procedure. DBS surgery is also used for dystonia, which often has its onset in childhood. Deep Brain Stimulation is not a cure for Parkinson's disease, nor is there conclusive data to show it staves off the progression of the disease. It's a way of treating Parkinson's which can be especially helpful for those patients who are still getting benefit from the medication, but are having lots of off times. Many of those patients say DBS has given their life back to them. It's not for everyone, but for many people, this has been an amazing treatment. The ClearPoint technology is an exciting development. The whole ability to create images of what is going on inside our bodies has advanced by leaps and bounds. CT (computed tomography) scans were introduced in the mid 1970's. The first commercial MRI scanner was patented in 1980. Since then, the ability to image the human body has advanced to the point where, according to Dr. Ojemann, they can create a 3D image that is almost like having a specimen in front of you. And, he said, imaging is only going to get better with time. As he explained this to me, he spoke with a sense of awe and wonder. At the same time, he said he hoped that 5 years from now, the treatments for Parkinson's will be even more advanced, targeting the PD at its source. He also hopes there will be a new treatment will not require brain surgery. It was my turn in feel the awe and wonder. Even brain surgeons can hope they won't be needed.